A woman wades near a beach in Monrovia, Liberia. Though poverty does not discriminate, women have fewer resources to cope. The first lady of the United States took the stage in Beijing and, in a 19-minute address, laid out a simple but soaring equation. "Human rights are women’s rights and women’s rights are human rights, once and for all," Hillary Rodham Clinton said as applause erupted. 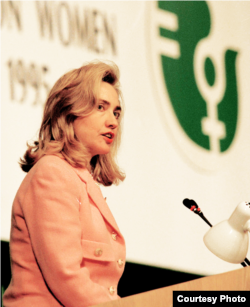 Hillary Rodham Clinton addresses the U.N. Fourth World Conference on Women in Beijing, Sept. 5, 1995. Her speech – delivered September 5, 1995, at the U.N. Fourth World Conference on Women – distilled the concerns brought forward by 5,000 official delegates and at least as many other participants. They challenged limits on women's and girls' education and health care, including reproductive health. Disparities in economic security, wages and inheritance rights. Violence against women, from domestic abuse to female circumcision to human trafficking. This fourth women's conference made history, 20 years after the first, by securing the pledges of 189 world leaders to help females attain equality. Leaders committed to an action plan setting benchmarks and ensuring that women have "a full and equal share in economic, social, cultural and political decision-making" in public and private life. "There was anticipation. There was excitement, too," recalled former U.S. Representative Connie Morella, who'd led a small, bipartisan congressional delegation to the conference. The Republican said she "felt the eyes of the world needed to look at what was happening to women.... I knew that my sisters in other parts of the world needed to have the protections I needed to have. In most instances, they needed them even more." Fiji islander Sharon Bhagwan-Rolls said the conference, which she’d attended as a journalist and delegate aiming for more media coverage for and by women, "had a huge impact." Personally, it set her on a course of activism – the kind celebrated in a new VOA documentary, "A Single Step: Journeys of Women Leaders." The 30-minute film showcases Bhagwan-Rolls and four others who are striving to aid women and indirectly advancing conference goals. More on that later. 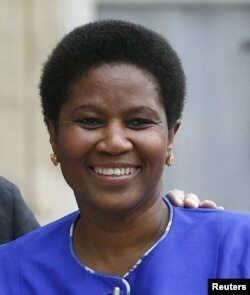 FILE - Phumzile Mlambo-Ngcuka, head of UN Women, points up gaps and gains in gender equality. As the conference’s action plan stated, "Equality between women and men is a matter of human rights and a condition for social justice and is also a necessary and fundamental prerequisite for equality, development and peace." Two decades have brought limited advances toward those lofty goals, according to Phumzile Mlambo-Ngcuka, executive director of U.N. Women. "If countries had lived up to all those promises, we would be seeing a lot more progress in equality today than the modest gains in some areas," she observed in an op-ed earlier this year. ● Nineteen women serve as heads of state, up from 12 in 1990. "But the rest are men. Eight out of every 10 parliamentarians worldwide are still men," Mlambo-Ngcuka reported. The Population Reference Bureau, in a new report examining women’s empowerment, shows Rwanda has the highest rate of female parliamentarians, at 58 percent. ● Maternal mortality rates declined 45 percent, though the goal was 75 percent by this year. And "there are still 140 million women with no access to modern family planning," Mlambo-Ngcuka wrote. "The goal for 2015 was universal coverage." ● Roughly half of all women are in the paid workforce, up from 40 percent two decades ago, Mlambo-Ngcuka noted. She added it likely would take decades more to achieve employment parity and longer still to receive equal pay. ​Mlambo-Ngcuka challenged current world leaders, meeting for the U.N. general assembly this month, to firmly recommit to the equity goals established in Beijing. More than 70 are expected to make pledges at a September 27 event. ● Katie Meyler, another American, started a foundation to get Liberian girls off the streets and into school – and, as the Ebola epidemic raged, operated the Monrovia school building as a community outreach center. ● Aparna Hegde, a physician in India, launched a nonprofit organization to improve the health of pregnant women, new mothers and babies in a country with one of the highest rates of maternal and infant mortality. "A Single Step" is "an important initiative for VOA as we profile women leaders around the world who are change agents and role models for future generations," said Kelu Chao, the news organization’s acting director. The documentary is narrated by Oscar-winning actress Sally Field, whose attendance at the Beijing conference "inspired me to take a bigger role in women’s rights," she told VOA. Since 2002, she has served on the board of the Vital Voices Global Partnership, a nonprofit organization working toward women’s advancement. The film’s senior executive producer, Beth Mendelson, wanted to make "a story of inspiration," stirring the kind of optimism she felt 20 years ago in Bejing while covering the conference as a public television field producer. "There was a certain buzz about the place – there were women from all over who wanted to make a difference," Mendelson said. "What we are learning around the world is that if women are healthy and educated, their families will flourish. If women are free from violence, their families will flourish. If women have a chance to work and earn as full and equal partners in society, their families will flourish. And when families flourish, communities and nations do as well. "That is why every woman, every man, every child, every family, and every nation on this planet does have a stake in the discussion" – and in reaching those goals.